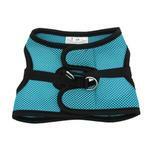 Get out and enjoy the summer days with your dog safe in the Step-in Cirque Dog Harness in Teal by RC Pet Products! 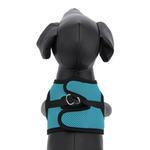 Step-in Cirque Dog Harness - Teal Customer Photos - Send us your photo! Posted On 06/29/17 by Peggy S from rego park, NY Yes, Peggy S recommends this product! my yorkie loves his new harness, it is cool and comfortable and Aspen looks great in it. 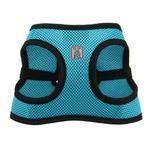 the step in harness is easy to put on has velcro closures. it also had a double loop for the leash to attach to. my dog is small and the small size fits him perfectly. he can run and play easily. i recently changed his leash to a retractable leash and the harness is more comfortable because he moves more easily with a retractable leash and the harness. 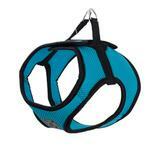 i highly recommend the cirque harness for dogs in teal for small dogs like my yorkie. easy to put on and beautiful. Posted On 05/18/17 by Mary M from Matthews , NC Yes, Mary M recommends this product! This harness is perfect for my little dog.. comfortable and easy to put on him. Doesn't rub and he hasn't escaped from it yet while walking him ! this harness is great for my Maltese! Posted On 01/10/17 by Amber N from Palm Bay, FL Yes, Amber N recommends this product! I even came back to order the next size up for when my puppy grows! I bought this harness in two sizes and love them both. This one is for when we need a harness over the outfit of the day. Harness is extremely easy to get on and off with no buckles or straps to irritate sensitive areas. Velcro stays secure even when being tugged on. Posted On 10/21/16 by Gretchen (Emmy) R from overland park, KS Yes, Gretchen (Emmy) R recommends this product! easy to put on..may go up a size next time as his weight has increased, oh,oh!! Excellent CS as usual and the shipping is fast! Posted On 10/10/16 by dale l from Sevierville, TN Yes, dale l recommends this product! Size is just right.Very easy to put on. pup has freedom to move and I know she's secure. Terrific experience and great product! I will definitely return and recommend others to baxterboo.com!